When night falls, another dimension in the world of photography opens and on this warm Saturday evening, twelve eager students experienced some wonderful conditions for their introduction to astrophotography. The Dark Side workshop is geared toward teaching students the basics for shooting stars in the night sky using all manual settings and long exposures to best capture the mysterious, magical night sky. We all met at the beautify Aperture Academy gallery in Campbell for orientation and a chance to introduce ourselves. It's always important for our instructors to get a feel for our student's skill levels and knowledge of their gear to best help them in achieving the desired results. Shortly before our workshop was to begin, my co-instructor called to say he was stranded on the freeway with a failed transmission, but with his wife and a tow truck on their way. It's important to Aperture Academy that we balance our instructor-to-student ratio in order to give each student personalized attention and instruction, but I couldn't justify canceling the workshop with people already en route. I made a quick call to fellow instructor, Matt Granz who had just returned form a cross-country tour with Yahoo! and thankfully he was available and would arrive in time to meet us at our shooting location. Woot! On with the show! To give students an idea of what they would be learning that evening, I began with a powerpoint presentation which covered the various types of star photography and equipment used, different exposure lengths for pin point stars and longer for the streaking "star trails." I also discussed tips on how to accurately focus and compose images in the dark. Then it was time to head out to south of San Jose to the Almaden Valley where the night sky is a bit darker and more stars could be visible. Once at the top of the hill, I helped students in getting their gear set up and taking test shots to zero in on focus and find a composition they liked with their particular camera and lens combination. Matt arrived just in time to help finish this process and we were then able to begin getting the real goods for some lovely star shots. Students were instructed on taking 30 second exposures to achieve the pin point stars. Large oak trees bathed in ambient light from the surrounding neighborhood were our foreground and some nice high, thin clouds colored by the evenings final glow added another sweet element complimenting the stars above. As darkness fell we also had some fun as I took a flashlight and wrote words (backwards) to teach students yet another element to be easily incorporated into night photography. We then moved on to 5 and ten minute exposures, changing ISO and aperture needed to capture star trails as the world slowly turns. Students learned of the importance of having a remote or shutter release chord, as well as using mirror lock-up to help reduce possible vibrations which can occur over the longer exposures. Matt and I also helped in adjusting white balance to keep the blueness of the sky while maintaining warmth in the foreground and in a way pleasing to the individual. A little more fun with light "writing" and as the night sky deepened, we made a final shot at a high ISO to see how many more stars could be pulled from the barely visible Milky Way. 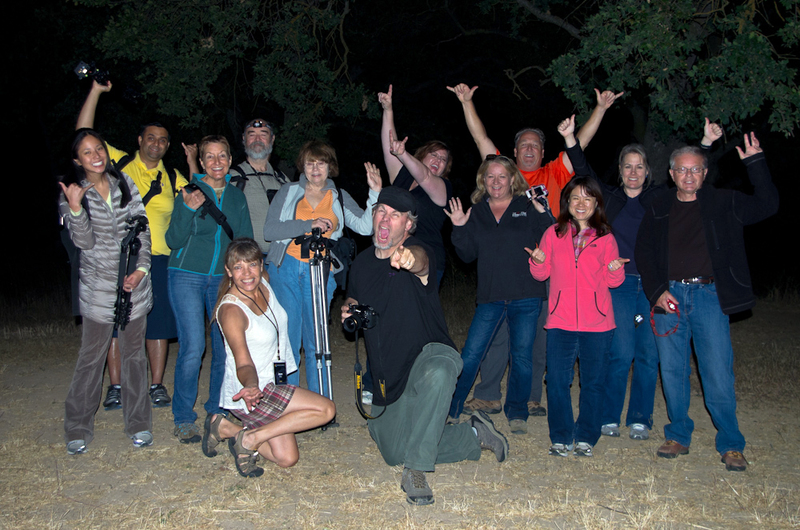 With memory cards filled showing a wonderful assortment of beautiful night sky images, this happy contingent of urban astrophotographers posed for a group shot memento before saying good-bye and heading home with new skills they can continue to use and develop.